The Zionist Archive was founded in 1919 in Berlin, but transferred to Jerusalem when the Nazis rose to power in Germany. After the Holocaust, the scarce remaining archival evidence of Zionism in Europe was brought to Israel, and in the ensuing years, all archives relating to World Zionist Organization and the Jewish Agency were collected in the Central Zionist Archives in Jerusalem. 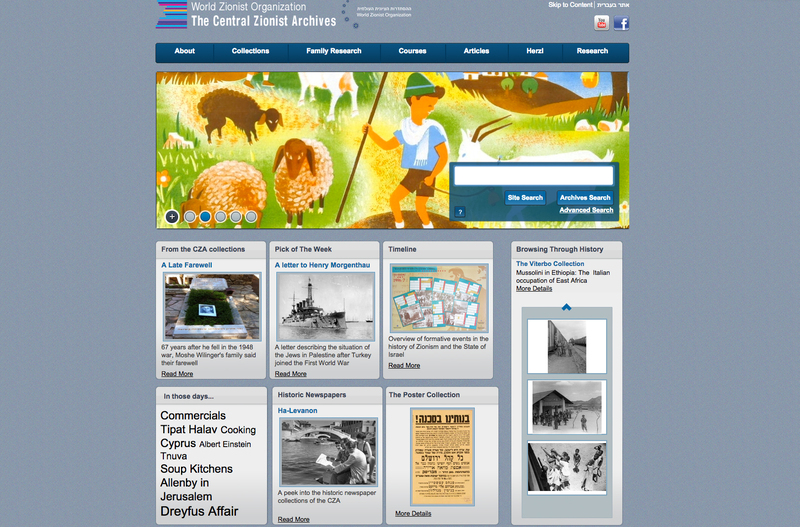 The Central Zionist Archives is home to a spectacular collection of over 4,000 posters related to Zionism and the formation of the State of Israel, forty of which are on display at the departure ramp at Ben-Gurion airport in Israel. Themes depicted include culture, politics and Zionist thought. The archive also features 18 volumes of handwritten journals belonging to Theodore Herzl between 1895 and 1904, from the beginning of his involvement in “the cause of the Jews” until his untimely death at the age of 44. The posters and journals have been digitally photographed by Ardon Bar-Hama and have been made available to the public in high-resolution photos.